Radiator Blog: Vote "YES" on Radiator 3 for Steam Greenlight! So I've been giving some thought as to what a sequel to Radiator 2 would look like... and I think it'll be a similar format, with a flagship game + other bundled scenes in the same package. It's fairly straightforward to put them all together in one deployment, which is probably one nice advantage to making all my games in the same Unity project folder. Introducing: the highly anticipated sequel Radiator 3. (Steam Greenlight page is here.) Right now the only segment that's definitely going into it is Rinse and Repeat, I'm still deciding what else I'd want to include with it... What will be new in Radiator 3? SteamVR support! Probably targeting a "Standing" spec, for Oculus Touch / Vive support. Please vote YES on Radiator 3 for Steam Greenlight, and please forward it to your friends and parents. 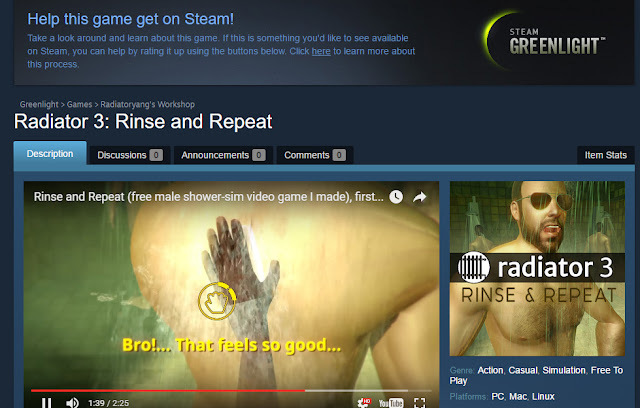 Together, we can make Steam a steamier place!